Iranian cultural history has been overshadowed by a grand narrative of political history that disregards shifts within the Iranian fields of culture. This focus on political history stems from Iran’s geopolitical position and its implication in international politics. A symptom of a homogenous historical time, such an over-determining political history collapses the continuities and discontinuities in cinema, theatre, literature, and other cultural spheres, as it provides a strictly political interpretation of cultural narratives. Decoupling this political grand narrative from multiple layers of historical time, reveals a range of creative cultural activities inside and outside Iran that have had long-lasting impacts on cultural fields. The history of Iranian film production, for instance, has been almost always explained within a political narrative. An interdisciplinary study of cinema, however, that looks at histories of culture, society, and politics, separately, provides a different reading of the history of cinema and its surrounding culture. For its unique position as an offspring of a new time and facilitator of modernity, cinema has been an indispensable part of modern life since the late nineteenth and early twentieth centuries. In registering contemporary events, cinema provided the conditions to capture the past and project it for the future. By virtue of that, cinema has brought history to life and become a primary source for social thinkers, critics, and scholars from its inception to the present. Its emergence within the conditions of urbanity set a precedent for its proliferation in city centres as places where images, ideas, and peoples were in motion. In the context of early twentieth century Iran, the socio-political circumstances of Tehran and other major cities, provided the conditions for the establishment and expansion of cinema in urban areas, and the projection and dissemination of never-seen-before images of peoples, lifestyles, and cultures. The acceptance, adoption, and usage of cinema by cosmopolitans of diverse ethnic, religious, and linguistic backgrounds, facilitated the conditions of circulation and cosmopolitanism in major cities, and further engendered a movie-going culture. Many cinema owners and enthusiasts soon seized on cinema’s potential for mass mediation and public education, and, in the absence of Iranian films, employed international motion pictures as didactic media in the service of national advancement. With the production of the first Persian-language films in the late 1920s and early 1930s, and the screening of Iranian past and present for the audiences, cinema became a forum for registering and projecting aspirations for sovereignty. During the same period, cinema also became a medium for Pahlavi state nationalism, as the government commissioned the making of films that portrayed an advanced country or the Iranian ancient glorious past. The popular film industry that emerged in the late 1940s was arguably an actualisation of earlier aspirations for national and cinematic sovereignty in a sustained cinematic form. While painting films with an Iranian colour, these popular films drew on global mainstream film narratives, tropes, and characters, and engendered an entertaining cosmopolitan film enterprise. Unlike what has been commonly argued, these films unraveled Iranian negotiations with rapid modernisation and provided a social commentary on national changes from the 1950s to 1970s. The pre-revolutionary alternative cinematic movement, also known as the New Wave, which solidified in the 1960s, continued Iranian popular cinema’s tradition of social criticism, albeit in a realist and arthouse cinematic form; this cinema which spoke to left-leaning international critics and cinematic movements gained attention from global film circles. The emergent alternative movement set the conditions for a cinematic revolution which happened prior to the political revolution of 1979. The Iranian Revolution of 1979 arguably changed the conditions of filmmaking in Iran. Despite the radical changes, however, Iranian cinema has continued its tradition of mediating social criticisms and national debates. Because of its realism and social commitment, in the last three decades, the post-revolutionary alternative cinema has once again gained the attention of international film critics and found a unique place for itself in film festivals. No other scholar has examined the history of Iranian cinema, from pre-revolutionary to post-revolutionary Iran, as extensively as Hamid Naficy. Taking a personal interest in cinema and multi-media visual culture from an early age, Naficy has come to be known as one of the authoritative voices on the history of Iranian cinema and television, both national and exilic. Considering his meticulous early work on documentary filmmaking in Iran, literature on Iranian and global exilic television and film production, and his seminal four-volume work on the social history of Iranian cinema, it is impossible – and I speak from personal experience – to be a student and researcher of cinema and not engage with Naficy’s scholarship. Naficy’s work, nevertheless, is not limited to Iranian cinema. Over the years, it has found much relevance in fields outside Film Studies namely, in Communication Studies, Media Studies, Post-colonial Studies, Sociology, and Anthropology. 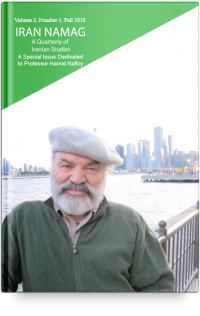 The special issue at hand, dedicated to Naficy, is a reflection of his rich, diverse, and theoretically-rigorous career. It has been put together to recognise and celebrate Naficy’s work and influence on cinema, media studies, and culture in general. Each contribution either attends to his academic scholarship, builds upon it, or tackles his artistic creations. One aspect that connects all the contributions in this issue, is the inter/transdisciplinary nature of Naficy’s work that has made his oeuvre a crucial foundation in interdisciplinary studies of visual culture. Shadowed by his academic contributions to the field of Cinema Studies, Naficy’s early film production and artistic work has not gained much scholarly attention. In this volume, Simran Bhalla, examines Naficy’s experimentation with video technologies in the 1960s and 1970s. Bhalla argues that Naficy’s films as a Master of Fine Arts student at the University of California, Los Angeles, capitalized on the possibilities granted by new technologies and functioned as media critiques that contributed to the counterculture of the period. His films were recently restored and screened at Northwestern University. By highlighting Naficy’s authority outside Cinema Studies, Mehdi Semati explores his transdisciplinary scholarship on International Communication. Drawing connections between his various scholarly works, Semati specifically attends to Naficy’s contribution to the problematisation of borders, politics of Otherness and belonging, and the more general relationship between culture and power. Being at the intersection of Cultural Studies, post-colonial theory, and media theory, Naficy’s oeuvre, according to Semati, is the epitome of trans/interdisciplinary scholarship, perhaps reflecting his character and upbringing. Another confirmation of this transdisciplinarity can perhaps be found in Michael Fischer’s commentary on Naficy’s caricatures of academics which he captured during public academic addresses. Regarding his simple line drawings as a window into Naficy’s self, Fischer looks for the evolution of a signature style. Asking, “What does the line reveal that the natural eye does not see?”, Fischer encourages the reader and viewer to cross the lines of the drawings and commentaries, to interpret them in good humour, and re-decipher them through their own lens. In a search for a deeper look into Naficy’s life, mind, and career, Kaveh Askari has contributed a revealing and thought-provoking interview with Hamid Naficy, as part of The Fieldnotes project for the Society for Cinema and Media Studies. Aside from exploring Naficy’s memories about his childhood, pre- and post-secondary student years, and his fascination and experimentation with multi-media visual culture, the interview also discloses valuable information about the institutional and production history of cinema, and some historical actors involved in the development of the industry, particularly in pre-revolutionary Iran. Mazyar Lotfalian’s article also attests to the transdisciplinary malleability of Naficy’s scholarship. Drawing on Naficy’s conceptualisation of transnational art production, Accented Cinema, and Third Cinema, Lotfalian investigates the relationship between art and anthropology. Examining Iranian diasporic paintings, installation art projects, performances, and photography after 9/11, an era that the author considers as exemplifying a new Cold War involving the US and Iran, Lotfalian demonstrates how Iranian visual culture has engendered a landscape for communication and critique. Lotfalian considers such endeavours as a form of active agency on the part of artists to create a different world in transnational settings. Sara Saljoughi’s contribution in this issue further attests to the centrality of interdisciplinarity to new studies of Iranian cinema. Questioning what is commonly considered as “Iranian Cinema,” Saljoughi uses new interdisciplinary paradigms to challenge conventional conceptions of the phenomenon. An homage to Abbas Kiarostami’s Ten (Dah, 2003), the article uses ten theses to tackle grand narratives that overlook historical discontinuities and collapse aesthetic and political specificities in Iranian cinema. Ten proves to be a useful film in this endeavour as it draws on Kiarostami’s past cinematic signatures and expresses the future of Iranian cinema, reflected in its digital mode of filmmaking and focus on women’s experiences. Mohammad Shahba’s article in Persian attends to challenges associated with the translation of English scholarship on Iranian cinema into Persian for the use of Persian speaking world. Having translated the first volume of Hamid Naficy’s A Social History of Iranian Cinema: The Artisanal Era, 1897-1941 (2011) to Persian in 2016, Shahba uses the translated volume as a case study to comment on essential methodologies for translation including a close rapport between the author and translator, and extensive research on the part of the translator. In identifying guidelines for translation, the author also alludes to the necessity of such translated volumes in interdisciplinary fields and for the fostering of a global dialogue on Iranian cinema. The contributions in the issue at hand, dedicated to Hamid Naficy, not only engage with and build on Naficy’s scholarship and artistic works, but they attest to the necessity of an interdisciplinary examination of Iranian visual media culture. The articles in this issue beg for a rethinking of conventional histories of Iranian cinema, rejection of grand narratives, and highlighting of particularities in visual culture; in other words, they offer new avenues for the future studies of Iranian cinema and media. We hope that the readers will enjoy perusing these articles in the same light.